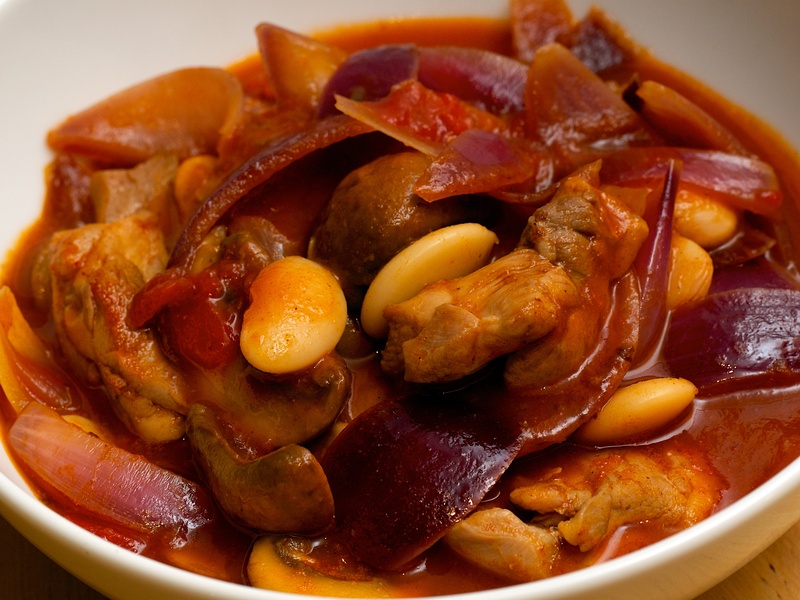 A quick and healthy Italian-style sweet & sour dish for midweek. We weren’t completely sure about the celery but it smells amazing in the pan with the red onions and tastes perfect in the finished dish. Serve with new potatoes and a green salad or steamed tenderstem broccoli. Wine Suggestion: We served this with a fuller Italian white, the l’Insolito by Michele Biancardi from Puglia. This is made from Minitolo which used to be thought of as a sub-variety of Fiano. Honeysuckle and white flower aromatics are tempered by a good citrus twist … sort of like the agrodulce. Slice the chicken breasts in half horizontally. Cover the 4 pieces of chicken with baking paper and flatten gently with a rolling pin. Dust the chicken pieces with the seasoned flour shaking off any excess. Heat 1 tbsp of olive oil in a non-stick frying pan and brown the chicken really well, then remove from the pan. Throw the onion and celery into the pan now and cook for about 3 minutes, then season. Add the tomatoes and cook for another few minutes or until they start to break down, then add the vinegar and sugar. Return the chicken to the pan and cook for 3-4 minutes or until cooked through, then stir in the parsley. Serve with green salad or steamed broccoli and some new potatoes if you like. This is one of our hearty dinners from the 5:2 diet we are on and it was very welcome this evening after getting in from the rain and cold. Full of flavour and filling despite the low calories! Heat a little olive oil to a medium-high heat in a pan and add the chicken, browning until golden on all sides. Add the paprika, garlic onions and mushrooms and cook until the onions and mushrooms have softened. This should take about 5 minutes. Add the sherry and scrape the bottom of the pan for a second to deglaze, then add the chicken stock, tomatoes and butterbeans. Bring to a boil then turn down and simmer for 15 minutes. Serve with the parsley sprinkled over the top and some crusty bread if you like. Wine suggestion: If you feel like a glass with this we’d suggest trying a red from Navarra, an under-rated region in Spain. The balance of juiciness and structure would work with the simple, smokey and rustic flavours of the dish. We were up in Belfast for the weekend which always means over-indulgence and I then flew to Birmingham for a conference and ate very boring and fatty food – what a waste! This was a much needed healthy dinner and yet again I had succumbed to M&S reduced tuna steaks (I just can’t help myself when it comes to food bargains!). This reads fairly dull but actually it was really tasty. I’m not a big fan of red onions (like I usually poke them out of a salad) but the way these are macerated with the lemon juice really takes the sting and sharpness out of them. Highly recommended for when you feel like something healthy and tasty (or if you have to use them cheapo tuna fillets you bought). I found this recipe in another of my old BBC Good Food magazines. Put a finely sliced red onion in a little bowl with the zest and juice of a lemon and some seasoning – leave to soak for about 5 minutes to soften the onion a bit. Put 250g of couscous into a large bowl and pour over 400ml of hot vegetable stock, cover with cling film and leave for 10 minutes. 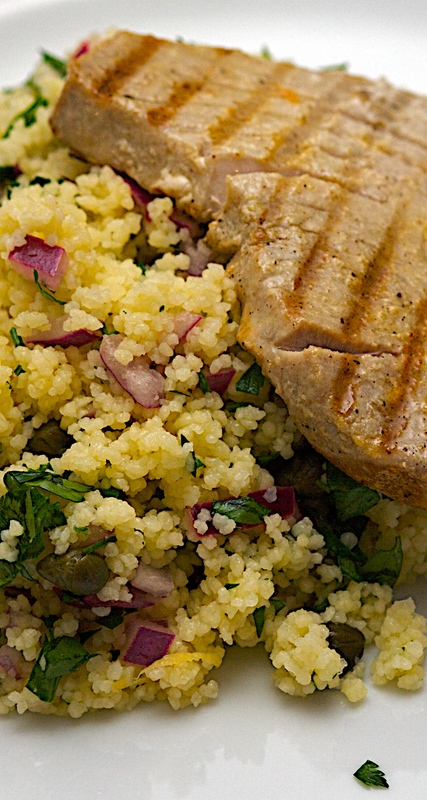 Season 4 tuna steaks, brush with 1 tbsp olive oil, then pat 2 tsps of English mustard powder over them. When the couscous is ready, add a bunch of roughly chopped flat parsley and 2 tbsp of capers to the onions – give it a good stir before mixing into the couscous with a fork. Heat a griddle pan and sear the tuna steaks for a minute on each side (more if you don’t like it rareish).